It is the leading discovery commerce platform. They are redefining the retail process by offering consumers a unique and personalized way to discover, learn about, and shop for the best beauty, grooming, and lifestyle products on the market. Second, different theme every month which means a new variety of products and packaging every month. Fourth, opportunity to try new and expensive brands and their products every month without burning hole in my pocket. Fifth, sometimes it has makeup products too. Half of their products or I guess more than that are sample sized products. This is the Information Card which comes inside the box having all the details like what the box contains and product description of everything. But I guess it is the standard card and not customized according to the particular box. Because everyone received different fragrance or shades be it the perfume, nail paint or any makeup product. 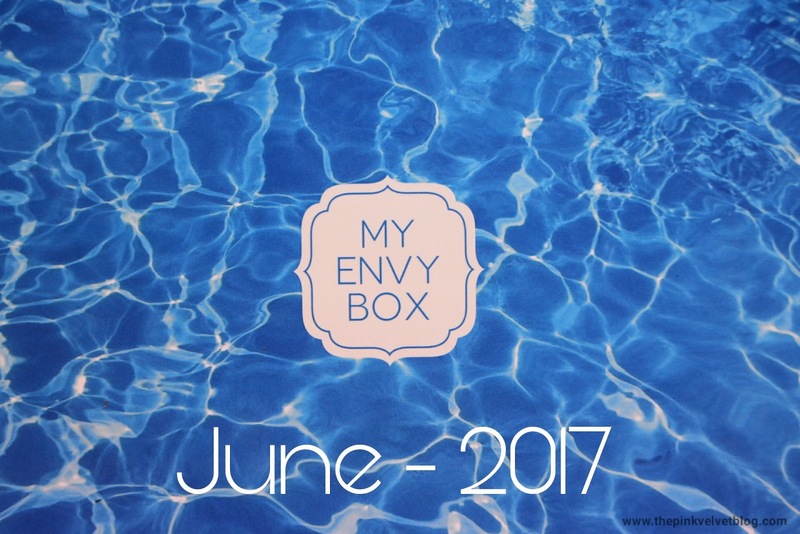 So what attracted me this month was their Blue or Beach Themed Refreshing Packaging plus all the products were from the brands which I haven't tried and so wanted to give them a try. So here is what all I got this month. I am really happy to receive makeup products this time. I immediately tried this before getting these shots clicked so it has that dark impression. 😄 Luckily, I loved the shade and it is really pigmented and gives the catchy glittery look to eyes. I have never tried this Brand because this is really expensive. Thanks to My Envy Box. I can try my hands on this now. 😄 This is Eladi Day Cream and Kumkumadi Nigh Cream and I am really excited to see how it works on my skin. But even if they work good, my pocket won't allow buying the full-size products from this Brand. Again, a Big and Expensive Brand. The fragrance is really impressive. Exotic impressions of sandalwood, floral and woody hint (totally, my type) and not totally sweet and floral. Pretty Good. This is totally a new Brand for me so I am quite excited. The description and everything which is written on it like it is After Sun Spray made from Natural Ingredients which reduces the redness, is attracting me towards it. Hope this will work good on my skin. Sounds exciting but yeah, some skincare products should've been full sized. All the products look amazing!! The foot wear spray is really unique!! I hope you enjoyed the Calvin Klein Eternity Intense Parfum very much. The fragrance is really heavenly, I think you should buy the whole bottle and use this for regular use. I used Eternity and Eternity Intense both.